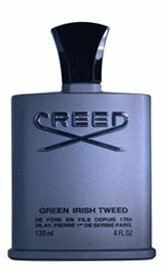 Creed Green Irish Tweed Cologne for Men 4 oz Eau De Parfum Spray The invigorating freshness of GREEN IRISH TWEED has consistently made it a top-seller in America and around the world. Refreshing as a walk through the Irish countryside, GREEN IRISH TWEED is one of the premier scents of the House of CREED. Its rich, fresh, green fragrance conjures up large, open spaces. GREEN IRISH TWEED transports us to the moor's high, green grasses, a hunting dog at our heels, all our senses awakened. Favored through the years by some of Hollywood's leading men, GREEN IRISH TWEED is spicy, sporty, original and unforgettable. Fragrance notes include: Sandalwood from Mysore, Ambergris, Violet leaves, French verbena, Florentine Iris.